The smaller engine should reduce the Volt's weight, further increase fuel efficiency, and help GM to contribute to the overall goal to reduce fossil fuel consumption, reduce the environmental impact and improve national energy security. The Chevy Volt range extender gas engine could slim down to three cylinders in the 2015 model year. If true, the move would cut vehicle weight, improve fuel efficiency, and perhaps shift to a greater reliance on the electric drive train. Currently the Volt comes with a 84-horsepower 1.4-liter four-cylinder gasoline engine whose primary purpose is recharging the battery pack. The report surfaced on Friday in Edmunds and was attributed to unnamed "industry sources," meaning that it is an unverified idea which might not see the light of day. However, GM is in a major effort to reduce vehicle weight, and the company did announce in 2011 a plan to develop a family of three- and four-cylinder engines, ranging from 1.0- to 1.5-liters. GM's CEO Dan Akerson recently spoke at the CERAWeek Energy Conference, spending much of his time on the need to increase energy efficiency, reduce fossil fuel use, not for climate change purposes but instead energy security. During the speech Akerson said "A good rule of thumb is that a 10 percent reduction in curb weight will reduce fuel consumption by about 6.5 percent. Our target is to reduce weight by up to 15 percent." For Akerson the purpose isn't an altruistic environmental cause, but rooted in America's financial security. Reduce fossil fuel imports by improving vehicle efficiency, and "The impact on our trade deficit could be enormous. According to Citigroup, achieving energy self-sufficiency could reduce the current account deficit by up to 2.4 percent of GDP." 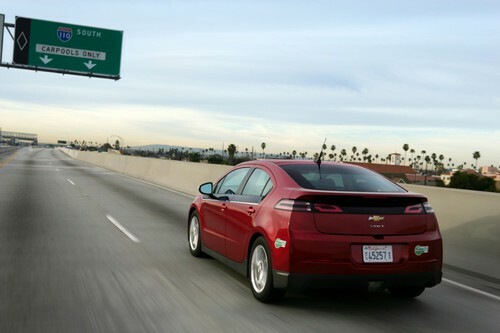 The Volt, according to Edmunds, is slated to get the three cylinder treatment for the 2015 model year, and it's planned for the Cadillac ELR in the 2016 model year. While the Edmunds report isn't a verified plan, Akerson's CERAWeek speech contains a number of strong hints that something of this sort is on the horizon for the 2016ish time-frame. Starting with that theme of national energy security, Akerson gave these hints as an example of efforts GM is undertaking to contribute solutions in this area. In addition to the 15% weight reduction goal Akerson talked about: advanced materials, including Nano steels, carbon fiber and resistance spot welding for aluminum structures; clean diesel engines; thermodynamic efficiency of gasoline engines using a range of technologies, including turbocharging, direct injection, variable valve timing and cylinder deactivation; introduction of more all-electric, plug-in hybrid, and eAssist light hybrid vehicles; and natural gas as a motor fuel, especially for big trucks. As we reported last week (Obama Administration proposes $2 billion of oil revenue to support clean vehicle research) this sort of talk tying vehicle fuel efficiency and national energy security is being spoken by President Obama. The proposed $2 billion in research money is directly in line with the goals Akerson spoke at CERAWeek. Akerson claimed "GM’s commitment will save 12 billion gallons of fuel over the life of the vehicles we build between 2011 and 2017."